Smith, Jr. : "THE CSS ARKANSAS: A Confederate Ironclad on the Western Waters"
The Confederate navy built and operated a large number of formidable ironclads during the Civil War. Unfortunately for them, these expensive fleets were typically bottled up in obstructed bays and waterways surrounding key cities and ports, forcing the ships to be destroyed by their own crews when Union armies approached. A single exception to this intractable CSN problem of free range ability for ironclads was the CSS Arkansas, which for three weeks in June and July 1862 was a terror to the US Navy on the Yazoo and Mississippi rivers. 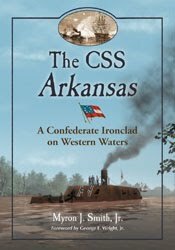 With a number of impressive 'Civil War on the western waterways' titles to his credit, librarian and professor Myron Smith has now turns his attention to this remarkable vessel with his study The CSS Arkansas: A Confederate Ironclad on the Western Waters, an incredibly detailed chronicling of the river gunboat's career from construction to self-destruction. One of the enduring mysteries surrounding the Arkansas is what exactly it looked like. No final blueprints or photograph's survive (and artist drawings vary on details), but Smith's book diligently sifts through the available evidence, arriving at the most likely scenarios for architectural design, propulsion system, and armament. A few modern schematic drawings based on outside research are reproduced in the text to help readers visualize the vessel. Unlike the other Confederate ironclads built as some variation of the Virginia design, the broadsides of the Arkansas's casemate were flat (perpendicular to the water) as opposed to sloped. It is posited in the book, but not explained thoroughly, that this improved stability. With rolled plates unavailable, railroad iron was used to armor the vessel. With so many other features described in minute fashion in the text, a full explanation of how this rail iron was applied would have been helpful (along with a drawing). A final note of interest on the appearance of the Arkansas pertains to its color. Painted a chocolate brown, the ship blended well into the western rivers' muddy waters, bluffs, and banks. Although Smith's end notes, which often collect dozens of sources under a single citation, require a great deal of work on the part of the reader to deconstruct, the author's books utilize an exhaustive depth and range of primary and secondary source materials. Helped significantly by the writings of four key officers from the Arkansas, the ship's 23-day operational career is meticulously recounted. The narrative begins with the ironclad's scattering of an enemy recon flotilla on the Yazoo River and its celebrated Mississippi River run past the entire US naval force arrayed against the Vicksburg defenses, both events occurring on July 15, 1862. Anchored under the Hill City's guns at the end of that exciting day, the Arkansas survived a night bombardment and ram attack ordered by Admiral Farragut. Over the next few days, other attempts were made to cut the ironclad out from under Vicksburg's protection, but these failed and the US Navy's upper and lower Mississippi fleets retreated in opposite directions. Sensing an opportunity, General Earl Van Dorn ordered the Arkansas to assist Breckenridge's land assault on Baton Rouge. The situation resulted in disaster on both counts. On August 6, the Arkansas, its always balky engines then beyond redemption, met its end at the hands of its own crew when immobilized above the Louisiana capital. Several attempts have been made over the years to explain the original cause of the chronic mechanical problems suffered by the Arkansas's engines. Smith does a good job of describing in some detail the nature of repairs needed [although, once again, some mechanical drawings would have been enormously helpful for landlubber readers unfamiliar with 19th century steam engines], but it has always been strongly suspected that these efforts were only band-aid attempts to ameliorate a larger problem which has remained a mystery. The book's suggestion that lingering damage from an earlier ramming by the Queen of the West is as reasonable an explanation as any. Smith's study does have problems of its own, mainly in the arena of editing. Typographical errors and repetitive passages abound. Also, the citing of internet postings as source material without offering more information about the writer's degree of authority on the subject strikes one as inadvisable. However, these flaws should not deter readers from appreciating The CSS Arkansas as the most thorough, and best by far, treatment of the vessel's history, surpassing the previous standard work on the subject by Tom Z. Parrish. 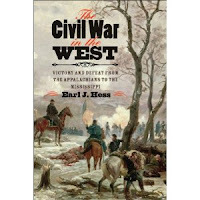 Most publishers request that reviews be held until release time [this one is scheduled for March, but I would bet it comes out a couple months early] so until then I thought I would post a little preview of Earl Hess's The Civil War in the West: Victory and Defeat from the Appalachians to the Mississippi (UNC Press, 2012). At its heart, The Civil War in the West is a theater level operational summary. Although Hess doesn't strictly define the boundaries of the "West" and generally leaves out East Gulf and South Atlantic coastal areas, his coverage of the campaigns and battles is suitably comprehensive. Readers with a high interest level in the irregular war will be gratified by the depth offered. While Hess disagrees with the recent theses of Mountcastle and Sutherland pertaining to the implications of the guerrilla conflict on the war's overall level of destructiveness, he certainly appreciates its physical scale and significance. Beyond the military campaigns, the Union army's constant struggle to maintain control over the civilian population in occupied areas, and at the same time foster viable trade practices that would not inordinately benefit the Confederacy, is another major theme of the book. The evolution of army policies and attitudes dealing with slavery and black enlistment is also broadly considered. Of the three levels of warfare -- strategic, operational, and tactical -- only the first two apply to studies of this type, and Hess's work is weakest on the first. With much of the military narrative comprising straightforward operational history, such high level matters are largely squeezed out. Even so, I think even those readers that generally devour everything western theater related might benefit from a refresher course integrating the conventional war with the pervasive guerrilla and civil relations conflicts. Generally speaking, though, the audiences best served by The Civil War in the West will probably be subject novices and those well read eastern theater enthusiasts looking to expand their area of study. For a long time, Kent State University Press has carried only one Civil War related series in their catalog, Lesley Gordon's Civil War in the North. However, the first volume from a new military focused series Civil War Soldiers and Strategies (edited by Brian Steel Wills) will be published in 2012. This inaugural study will be Hampton Newsome's Richmond Must Fall: The Richmond-Petersburg Campaign, October 1864. Brett should be excited about that. In May 2012, University of Missouri Press will publish Louis Gerteis's The Civil War in Missouri: A Military History . It is highly unfortunate that the overwhelming amount of amateur and scholarly Missouri guerrilla war publications have obscured the state's significant (and, to me, endlessly fascinating) conventional war experience. Before now, no one has attempted an all encompassing examination of the regular campaigns and battles in the state. Although Gerteis himself didn't pay much attention to the subject in his previous work, Civil War St. Louis -- a fine socio-political city study if you're interested --, I remain optimistic about this book's landmark potential. George Henry Thomas: As True As Steel by Brian Steel Wills (Univ Pr of Kansas, 2012) is currently scheduled for a March release. After a long hiatus, Thomas bios have been sprouting up all over the place. I didn't bother with Bobrick or Broadwater, and Christopher Einolf's book, while generally well regarded, didn't have the detail I was looking for. With this one (600 pages), and the Corinth study mentioned earlier, the fine editors at Kansas seem to be hearkening back to a time of more liberal page length limitations. Savannah Squadron - "The Best Station of Them All"
In glancing through the catalogs listed below, one book stood out as particularly appealing in terms of my own personal interests. For Civil War naval history students, a pathbreaking study by Maurice Melton will be released during the spring 2012 publishing season. The Best Station of Them All: The Savannah Squadron, 1861-1865 (Univ of Ala Pr, August) is a big book at 632 pages, with a cringe inducing price tag to go along with it, but it promises to provide unprecedented coverage of the Confederacy's naval war along Georgia's coast and inland waterways. A number of the university presses have their Spring-Summer '12 catalogs available for viewing online. So far, you can see or download LSU, Mercer, Oklahoma, Kentucky, Alabama, and North Carolina. Scroll down the sidebar to the University Press Profiles for links to each press' main page. 1. The Civil War in South Carolina: Selections from the South Carolina Historical Magazine edited by Lawrence S. Rowland and Stephen G. Hoffius (Home House Pr, 2011). A well selected compilation of over 40 articles from the SCHS's scholarly journal, the book's 607 pages cover a variety of wartime subjects (at least half are military in nature) across all areas of the state. 2. Virginia at War, 1865 edited by William C. Davis and James I. Robertson, Jr. (Univ Pr of Kentucky, 2011). This is the concluding volume of the five-part UPK essay series concentrating on Virginia home front and societal issues over each year of the war. 3. Hungarian Emigres in the American Civil War: A History and Biographical Dictionary by Istvan Kornel Vida (McFarland, 2011). The Civil War contexts of the 1848 uprisings in Europe typically focus on the Germans, but thousands of Hungarians also immigrated to the U.S. in their wake. A professor of American history at a Hungarian university, Vida brings these men's services to light with a scholarly work that is part narrative, part biographical register. At last, a major work concerning the 1862 "Siege" of Corinth is in the offing. Although from the title, Corinth 1862: Siege, Battle, Occupation (Univ Pr of Kansas, May 2012), it certainly looks like Smith is going for a broader look, 472 pages should afford enough space for a decent history of the siege operation. 1. Tried Men and True, or Union Life in Dixie by Thomas Jefferson Cypert, edited by Margaret M. Storey (Univ of Ala Press, 2011). East Tennessee unionists get all the press, but adherents to the old flag were present all over the state. Cypert, an officer in the 2nd Tennessee Mounted Infantry (US), penned this memoir (published here for the first time) to defend the actions of unionists during the war and to support their cause in the postwar political struggle. It is also a descriptive account of the irregular conflict in West Tennessee. 2. The Library of Congress Illustrated Timeline of the Civil War by Margaret E. Wagner (Little, Brown & Co., 2011). This coffee table sized book, similar to a condensed The Civil War Day by Day but with more visual focus, is a chronological rendering of significant events from the war. The top half of each page is filled with captioned photos, maps, drawings, etc. 3. Soldiers of the Southern Cross: The Confederate Soldiers of Tallapoosa County, Alabama by William Gregory Wilson (Author, 2011 2nd ed.). This is a documented narrative history and roster study of the county soldiers that served in many 'Bama units in the western and eastern theaters. Wilson has a web presence for the book here. 4. Views from the Dark Side of American History by Michael Fellman (LSU Press, 2011). A collection of essays that taken together comprise something of a career memoir, this slim volume promises to be an personal look into the perspectives of a historian drawn to more disturbing subject matter. Byrd: "A UNIONIST IN EAST TENNESSEE: Captain William K. Byrd and the Mysterious Raid of 1861"
During the first months of the Civil War, with Confederate general Felix K. Zollicoffer pursuing a generally conciliatory policy in East Tennessee, rival militias coexisted, wary of each other's intentions but without a large degree of physical violence between them. This all changed with the November 8, 1861 railroad bridge burning campaign conducted by pro-Union militants, a dramatic event that instigated a large scale Confederate crackdown characterized by mass arrests and the hanging of suspects. While the planned Federal invasion from Kentucky was canceled, pro-Union militias were targeted by Confederate authorities as immediate threats. The following month, in Hawkins County (somewhere between Lee and Pumpkin valleys), a band of unionist militia was attacked by local pro-Confederate forces. Their sixty-year-old leader, William K. Bird, was allegedly abused and killed after his capture, leading to widespread calls by unionist Tennesseans for revenge and prosecution of the perpetrators. The political, military, and judicial matters surrounding this "raid" are the subject of Marvin Byrd's A Unionist in East Tennessee. In his book, the author does a fine job of communicating the charged political atmosphere in 1861, in isolated Hawkins and Hancock counties and in East Tennessee at large. With local Civil War history publications (especially those authored by descendants) often characterized by wild leaps from scant evidence, Byrd's more careful handling of the available source material is refreshing. Just about every aspect of the raid -- who ordered it, who led it, the exact location of the clash, and the particulars of what happened -- is shrouded in mystery and conjecture. While the site location remains unknown and details of the fighting (often characterized as an ambush) sparse, the author constructs a strong case that the planning and conduct of the raid was a local affair not ordered by Confederate military authorities. Additionally, although built around circumstantial evidence, Byrd's case that the raid was planned and led by local secessionist and Confederate congressman Joseph Brown Heiskell is strongly presented. What happened after the death of William Byrd is better known, and the author's coverage of the region's arrest and imprisonment record is extensive, as is the subject of lawsuits (during and long after the war) brought against the alleged attackers and murderers of Byrd, including the socially and politically prominent Heiskell. On the complaint front, while the book's endnotes indicate a wide net was cast for relevant source material, a bibliography should have been included. Also, the single tiny East Tennessee county map provided was wholly inadequate for guiding readers to the locations mentioned in the text. Especially for non-natives, a detailed map of Hancock and Hawkins counties would have been enormously helpful. A Unionist in East Tennessee can be recommended on a number of counts. While the subject of East Tennessee unionism at large has been covered well in many books and articles, this monograph provides a satisfactorily researched and unique micro-examination of an obscure incident between opposing local forces in an area of East Tennessee far less well studied than others. Also, readers with genealogical interests will appreciate the massive amount of individual and family connection information uncovered by Byrd and presented in the text. Finally, scholars of post war lawsuits brought against ex-Confederates will find a great deal of useful information for their pursuits. Dominated by old and/or amateurish works, the Civil War in the Indian Territory possesses on the whole one of the most deficient bodies of literature in Civil War historiography, so I was surprised and delighted to find that the next issue of Blue & Gray Magazine will tackle the battles of Chusto-Talasah (Caving Banks), Chustenahlah, Bayou Manard, Old Fort Wayne, Cabin Creek, Devil's Backbone, and Honey Springs. The level of authority that author Michael J. Manning possesses on these subjects is unknown to me, but I really hope he does a good job and I also hope my B&G renewal gets processed in time. 1. CSS Alabama vs USS Kearsarge: Cherbourg 1864 by Mark Lardas (Osprey, 2011). Vol. 40 in Osprey's Duel series. 2. Gettysburg's Forgotten Cavalry Actions: Farnsworth's Charge, South Cavalry Field, and the Battle of Fairfield, July 3, 1863 by Eric J. Wittenberg (Savas Beatie, 2011). This is a newly revised and updated edition. In addition to the main text discussions of the three major actions named in the book's subtitle, the appendices include OBs, walking/driving tours, and the full text of Wittenberg and Petruzzi's rebuttal of Gettysburg licensed tour guide Andie Custer's theory on where Farnsworth's charge occurred. Petruzzi has a nice post about the new edition here. 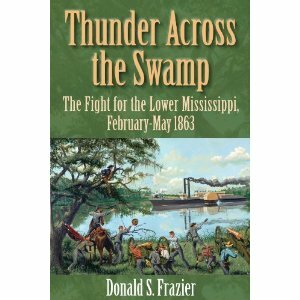 Frazier: "THUNDER ACROSS THE SWAMP: The Fight for the Lower Mississippi, February - May 1863"
Not completely neglected, the Civil War in southwest Louisiana has received some fine coverage in the literature, from Christopher Pena's detailed history of the 1862 fighting in the Lafourche District to David C. Edmonds' classic account of the 1863 Texas Overland Expedition. However, sandwiched in between these campaigns occurred perhaps the most interesting operation of them all, the 1863 Bayou Teche Campaign. Almost completely overlooked in the literature beyond a deficient work published in the 1970s, the Teche campaign has finally received its due with Donald S. Frazier's Thunder Across the Swamp: The Fight for the Lower Mississippi, February - May 1863, the second volume of the historian's projected four-volume "Louisiana Quadrille". In the spring of 1863, the two major Union armies in the Mississippi Valley, U.S. Grant's Army of the Tennessee opposite Vicksburg and Nathaniel Banks' Army of the Gulf near New Orleans and Baton Rouge, were embroiled in a debate on how best to cooperate in the capture of Vicksburg and Port Hudson. While it was assumed that one army would detach a large force to aid the other, then combine armies to tackle the remaining post, the generals instead elected to move in opposite directions, Grant east to the Mississippi capital and Banks west up Louisiana's rich Bayou Teche region before turning north to the Red River. Both were ultimately successful. Combining deep research with lively writing and numerous, highly detailed maps, Thunder Across the Swamp is shining example of the best of modern Civil War campaign history. The federal movement up the Teche was a well conceived combined operation, composed of a direct land attack by Banks' main force against Confederate General Richard Taylor's small army at Fort Bisland and a water-borne turning movement via Grand Lake. Taylor's entire command barely escaped destruction when the federal amphibious force, Cuvier Grover's infantry division, landed at Irish Bend, struck the weak Confederate rear but failed to cut off the enemy escape route. Taylor's army had survived, but on its long retreat almost disintegrated through straggling and desertion. Meanwhile, the Army of the Gulf engaged in large scale property destruction (a prelude to the Overland and Red River campaigns) and extracted a vast amount of supplies from the rich farms and plantations in the region. Gunboats also struck north up the Atchafalaya River and opened communications with Union naval forces above Port Hudson. In addition to his analysis of General Banks's strategic options and intentions within the wider Union effort to open the Mississippi to navigation, Frazier's operational coverage of the Teche campaign is just as thorough and his tactical battlefield narratives first rate. Skillfully incorporated into the main narrative, participant accounts are numerous and representative of all ranks. The battles of Fort Bisland and Irish Bend and smaller fights at places like Vermilion Bayou, Fort Burton, Washington, and Chenyville, are meticulously recounted at a micro-tactical scale. Readers who revel in regiment and company level battle history are richly rewarded here. Additionally, the book's cartography, a diverse collection of 56 strategic, operational, and tactical maps, is intimately tied to the text, never leaving the reader lost on the battlefield or on the march. The amount of detail conveyed, in terms of terrain features and unit positions and movements, is immensely satisfying on all counts. While the book has a few too many typos to escape mention, other complaints are relatively minor. An explanation of why Bisland was chosen as the main strongpoint of the Confederate defenses on the Teche is not explained. Given how easily it could be (and was) turned by water movement, one suspects it was a concession to non-military concerns, protection for the valuable agricultural resources located upstream. Also, Banks is perhaps not accorded enough credit for a sound operational plan, one that came within a hair's breadth of bagging Taylor's entire command. On the Confederate side, while the author is justly critical of Henry Sibley's failure to impose march discipline on the retreat from Irish Bend, Taylor's responsibility as overall commander should not be overlooked. Though one hesitates to label any study definitive, in a military historical context, Thunder Across the Swamp approaches that level as closely as anyone should care to wish. Also, in terms of informational depth and quality of presentation, the book significantly raises the bar of reader expectation for the series. If things continue as they are going, volumes 3 and 4 will be major events in the publishing of Civil War Trans-Mississippi theater military history. In a time when cost cutting too often results in history books with significant material and presentational deficiencies, Frazier and State House Press ought to be congratulated for holding nothing back. Thunder Across the Swamp brilliantly bridges a significant gap in Louisiana Civil War military historiography and is deserving of the highest of accolades. "Some of the finest articles exploring the Civil War in South Carolina, first published in the South Carolina Historical Society Magazine, are collected here in a remarkable volume that stretches from the gathering for the Secession Convention in December 1860 until the battles that followed the Confederate surrender in 1865. The book provide both sides' perspectives on the opening attack on Fort Sumter and on Sherman's March. Every corner of South Carolina is featured in these selections because the War touched the lives of everyone. Contributors to the volume include some of the state's leading historians". I hope to have my review copy soon. Long out of print and often rather expensive to find in fine condition on the secondary market, the best history of the Battle of Carnifex Ferry has been reissued by Quarrier Press with a new introduction by author Terry Lowry. September Blood is an essential element to the West Virginia Civil War bookshelf. I've never read Lowry's contributions to the H.E. Howard unit history series, but Last Sleep: The Battle of Droop Mountain November 6, 1863 and The Battle of Scary Creek: Military Operations in the Kanawha Valley, April-July 1861 are also highly recommended by me. Like many other unpublished Civil War nuts I suspect, I always have book ideas swirling around in my head on neglected subjects that never actually get off the ground. One of my favorites is a history of the first year of the war in Kentucky, roughly from Sumter through Johnston's retreat from Bowling Green. However, knowing that my not doing a project is no loss to Civil War scholarship, I'm always glad to find someone else crossing something off my wish list. While James Finck's Divided Loyalties: Kentucky's Struggle for Armed Neutrality in the Civil War (Savas Beatie, May 2012) covers a slightly different time period (November 1860 - November 1861), there is more than enough overlap to capture my interest. I do wish authors and publishers would come up with a more original title phrase than "divided loyalties" when describing areas of the South with particularly contested civilian populations. It is almost as overdone as the "thunder" of so many campaign and battle histories. 1. The Denbigh's Civilian Imports: Customs Records of a Civil War Blockade Runner between Mobile and Havana by J. Barto Arnold III (Inst. of Nautical Archaeology, 2011). This is a massive reference book containing invoices and customs forms from the blockade runner Denbigh into Mobile. Beyond allowing researchers to track what civilians imported through the blockade, the book should also inform readers about changes in price and item over time. 2. The Campaigns for Vicksburg 1862-63: Leadership Lessons by Kevin J. Dougherty (Casemate, 2011). Through the lens of Vicksburg, the author analyzes 30 different aspects of leadership using vignettes involving 30 political and military personalities associated with the campaign.